The photographers of VII – Christopher Anderson, Alexandra Boulat, Lauren Greenfield, Ron Haviv, Gary Knight, Antonin Kratochvil, Christopher Morris, James Nachtwey, and John Stanmeyer – are accustomed to witnessing, up close and in person, events of international turmoil. That is the duty of a photojournalist: to bear witness and to document history, and few would dispute that these photojournalists are among the world’s very best at telling the stories of our time. WAR reveals the true story of what our country has faced since that fateful Tuesday in 2001. 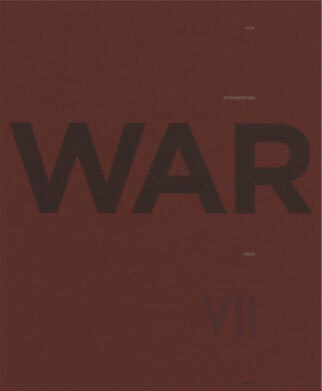 Featuring approximately 300 photographs, insightful vignettes, and three thought-provoking major essays, WAR is a powerful collaborative effort from VII, a cutting-edge photo agency co-operatively owned by nine elite photojournalists. The three full-length essays, written by eminent journalists Peter Maass, Remy Ourdan, and David Rieff, discuss the three major crises of the 21st century from a social, political, and militaristic standpoint and further illuminate the powerful photographic images in WAR. Introduction written by Peter Howe. In addition to documenting the experience of 9/11, WAR takes an incisive look at images from Afghanistan and the hunt for Osama bin Laden, as well as the air strikes and US occupation of Iraq. In WAR, the photographers of VII have created a shockingly intimate portrait of US foreign policy and the most critical moments of American history in the beginning of the 21st century. What you see here will stun you.